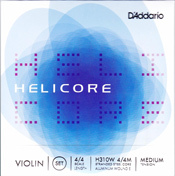 Since introduction in the mid 1990's, Helicore have achieved a remarkable acceptance among students and professionals worldwide. The stranded metal core gives quick response due to the thin diameter of the strings. A great choice for Electric instruments. Long Scale is for Violas 16 inches and larger. Medium Scale are for Violas 15-16 inches. Short Scale is for violas under 15 inches. The new Extra Long Scale is for large violas, when the Long Scale does not fit. Ball can be removed from A string to be used as a loop.